Sowing anything into the open ground now - even under cloches - is pretty much a waste of time in my experience, as the weather is so unpredictable over recent winters that even if it germinates and grows on well for a while - poor weather later on in winter may destroy it and waste expensive seed. That is unless you live in a very mild area, with very well drained soil and don't have a slug problem (is there anyone who doesn't?. If you're lucky enough to have a well drained, warm soil and are really desperate to sow something - you could sow varieties of overwintering broad beans and peas outside - but I've always found that sowing into modules or pots of peat-free compost in a greenhouse or on your windowsill in late Jan. or early Feb. next year is the most reliable method and will produce far healthier plants, with an equally early, and usually far heavier crop. It's always far safer on my heavy soil - avoiding the risk of possible plant losses through bad weather or slugs. Few of us want to spend cold evenings outdoors slug hunting - and they're still active unless the winter is bitterly cold! The long spell of snow and freezing weather earlier this year was a warning about how unpredictable our weather is now. Spending a bit of time in a warm and cosy house, planning next year's rotations really well and choosing what varieties you want to grow, is a far more useful and productive way to spend one's time! You could still sow suitable types of winter lettuces like 'Winter Gem Vaila' (little gem type), 'Rosetta' - (a reliable indoor winter butter head), and also old fashioned varieties such as 'Black Seeded Simpson' a huge loose-leaved butter head type which can be picked one leaf at a time. Seed is expensive and with expensive F1 seeds you don't get many in a packet - so if you are buying F1 seed - then individual seed-sowing into modules is by far the most cost-effective method - even if your tunnel soil is still warm enough for the germination of seeds sown directly in the soil. Sowing into modules also reduces the risk of slug or early woodlouse damage and provides better air circulation - especially if you are using organic peat-free seed composts which are by far the best - thereby preventing 'damping off' diseases. Even the cheaper 'value' lettuce or other salad mixes can still be successful sown thinly in early Nov. - I've often harvested these from the polytunnel until the following May! The reason those mixes are cheaper is because they are usually older, tried and tested, 'bog-standard' open-pollinated varieties (easier and cheaper to produce), which can often be more disease and cold-resistant than 'F1' hybrids, which are more expensive to produce. You can still sow peas for pea shoots - 'Meteor' or Oregon Sugar Pod are good varieties widely available. Soaking overnight and pre-sprouting somewhere warm first is helpful to prevent rotting or mouse attack! Some varieties of non-hearting leafy cabbage greens such as Unwins 'Greensleeves', that have been specially bred for winter sowing, could start to produce useful leaves in the tunnel early in the new year if sown now. 'Cavalo Nero' and 'Ragged Jack' or Russian Red kale can still be sown for baby leaves/micro salads, as can some of the hardier oriental greens like mizuna, mibuna, oriental mustards, cress and oriental salad mixes - depending on the weather these can grow on quite quickly now if it's mild. If the weather is very cold after they've germinated, they will still grow on slowly, with growth speeding up early in the new year when the light increases. Seedling micro-green crops like mustard and cress grown on damp kitchen towel or in seed compost and sprouting seeds can also be a useful addition to winter salads - and this is easy to do in a warm kitchen. Make sure you rinse any jar-sprouted seeds well and regularly - preferably 2/3 times a day, with filtered water, to avoid bacteria, moulds or spoilage diseases building up. The warmer your kitchen - the more often you will need to rinse them - but the faster they will grow. It's often worth sowing a fast-growing early carrot variety such as 'Early Nantes' or 'Amsterdam Forcing' in pots, deep containers, or even in long modules like loo roll middles, for planting out into the tunnel later - these will overwinter perfectly if covered with fleece and will crop in late winter/very early spring - thereby avoiding early carrot fly. With a little more warmth - say a kitchen windowsill, parsley can still be sown - the flat leaved variety 'Italian Giant' is much hardier and is by far the most productive and best-flavoured. Calendula, borage and limnanthes (poached egg plant) will all flower extra early next year if sown now and these will attract beneficial insects like hover flies to help with pest control and also bees to help with pollination of crops like early broad beans. Germination of all of the above will naturally be far quicker given average room temperature in your house and the faster they germinate the less likelihood there is of seed rotting. If you germinate things in the house - you must put them out into the tunnel/greenhouse into good light as soon as they have germinated, otherwise they get drawn and spindly from lack of light - and they'll be far more prone to diseases. Another reminder that if it's necessary to water any seedlings in modules - then water them from below by sitting in a tray of water briefly for a minute or so. Never saturate them - and ventilate well. This will hugely cut down the risk of 'damping off' disease. Using a good organic, peat-free seed compost - like the Klassman which I use - is worthwhile too, I find that seedlings are far healthier in that. I then cover any seeds that need it with vermiculite which also promotes good drainage as well as air-circulation around seedling's delicate stems. If frost is forecast you can use fleece for overnight protection - but uncover them in the mornings to let the air in and dry the fleece well before using again otherwise it will give no protection. There's still just time to sow a green manure crop, as soil temperatures are still above 50degF/10degC after a relatively mild autumn. Mustard, red clover, phacelia and Hungarian grazing rye are good ones to sow in the tunnel or greenhouse or for outside. Claytonia also makes a good green manure which encourages worm activity and is also a useful, fast-growing edible salad in winter. These are all for digging in in early spring. They provide protection and cover for soils to prevent leaching of nutrients, provide carbon which is food for worms and soil dwelling bacteria - eventually becoming humus which encourages beneficial soil microbes and benefits plant health. Clover and phacelia also have very pretty nectar producing flowers which attract bees and other beneficial insects if you leave some at the end of a bed to flower in spring. Overwintered biennial herbs such a s parsley and coriander will flower early next year and do the same. Borage also makes a very good green manure. It makes a lot of green matter which encourages worms and also has a long tap root which draws up useful magnesium from low down in the soil profile. If you leave one or two plants to grow on it also adds a nice cucumber flavour to healthy spring smoothies and salads! Keep green manure seed beds damp until germination occurs and if we have a very cold winter, cover with fleece if hard frost is forecast while the seedlings are still small. Sow all seeds thinly to avoid overcrowding. For a really early crop of big bulbs next year - most varieties need cold weather for good root development. Choose firm, plump and healthy outside cloves from this year's crop, or buy certified virus-free ones from garden centres - not supermarket bought bulbs which will be unsuitable for this climate and may even bring in diseases like onion white rot - this can survive in the soil for about 20 years and be spread around the garden on your boots - infecting all members of the onion family including leeks! For the same reason I don't use onion sets in the vegetable garden. If I want some extra early onions - then I grow some sets in pots or containers. This way they're much earlier than any grown in the ground - and if you're unlucky enough to get any disease you can just throw the remains, along with the compost they were grown in, into the food/green waste recycling bin - rather than composting them and again spreading disease around the garden! I grow all my main crop onions from seed sown in early March - it's very easy and by doing this I avoid the possibility of onion white rot. Seed-sown onions also are far less likely to 'bolt' in difficult weather - a major problem this year - and they always keep far better. Mine always keep until well into spring - if they last that long! Buy some suitable potatoes now to produce your earliest ever crop of potatoes next year! I always save seed tubers from my early crops for planting my extra early and early crops the following year. But if you haven't saved any early or second early tubers from your own spring crop, a good way to 'cheat' is to keep an eye out for suitable varieties of potatoes such as 'Annabelle' or Charlotte in the veg departments of shops before Christmas. As long as the tubers you buy are organic, which won't been treated with anti-sprouting chemicals - these will be raring to go and will happily send out nice, fat, eager-to-grow shoots quickly, if you take them out of the plastic bag so that they don't sweat and rot - and bring them into a warm place. If they're reluctant to sprout I always put them in a dark place like a box under the kitchen table. These can be used for planting 'extra early' potatoes into pots of peat-free compost in mid-January, so that you can have your first new potatoes at Easter! (M&S usually have the best quality 'Annabelle' - which will readily grow when planted). Greengrocers may also have some suitable varieties - especially harder to get ones like the purple varieties. Any potato is suitable - it's just that the early varieties will give you a crop far sooner - but they'll all grow! Some seed suppliers may also have Lady Christl available before Christmas. I have grown this variety for many years and it's the fastest 'bulking up' variety I've ever found for doing these 'extra-earlies', having usable sized tubers underneath them after only 8 weeks of growth - well before any other early variety. I start them all off in 2 litre pots which are easier to keep together in a group which can be easily covered with fleece if frost threatens. Duke of York, Apache, Sharpe's Express and the purple-fleshed early maincrop variety Violetta are also good for doing extra earlies as they are second-early varieties - but any potato variety will do - it still works. Although others may not be as early - especially maincrop varieties. But whichever variety you have - if they're grown in a polytunnel or greenhouse - they will still be miles earlier than any grown outside, so are well-worth growing! 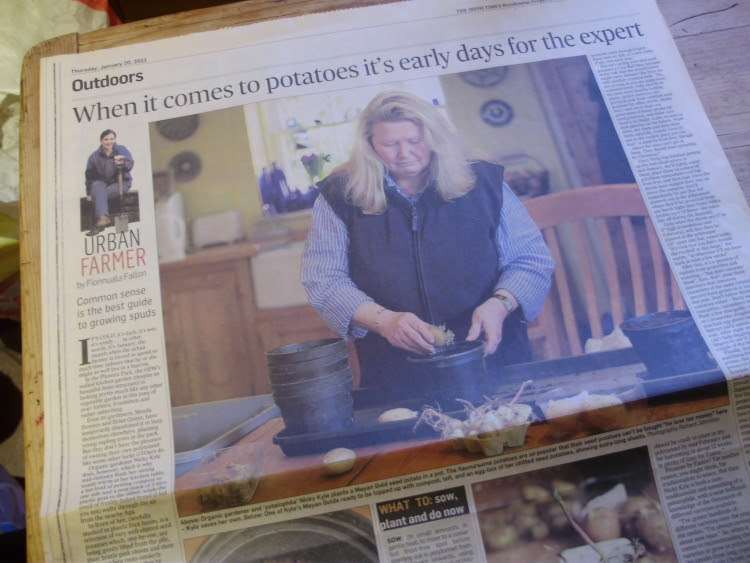 Below there's a link to the article written by Irish Times journalist Fionnuala Fallon in 2011, about how I plant my 'extra early' potatoes in January for Easter - sadly now without the photographs, so I've taken a picture of the main picture in the paper, which you can see above.